Sitting Indian With Spear Bookends. Very well done in cast resin. These bookends, set of 2, are cast and hand painted USA artisans who love their work and show pride in craftsmanship. This brand of bookend is the upper end variety of look and decor. 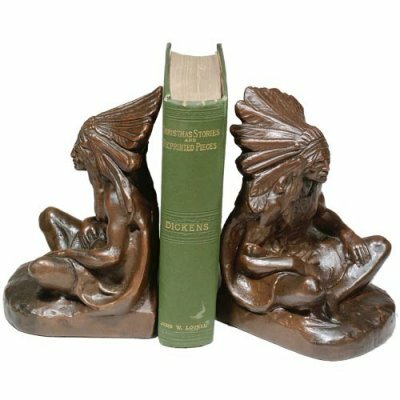 Please allow up to four weeks to receive a pair of these collectible book ends. Many of these bookends are actually cast when we order them. Set of two cast resin Sitting Indian With Spear Bookends.